Custom Pneumatic Products Providing fluid handling solutions that meet our customers’ defined performance requirements has been a priority since Pneumadyne’s inception, setting us apart in the miniature pneumatics industry. Our experienced engineers welcome the opportunity to assist in the design and manufacture of pneumatic control systems and custom directional control valves, fittings or manifolds. Whether you need standard pneumatic components or custom pneumatic products, we take the time to understand your application and recommend components and systems that best fit your requirements. Rely on Pneumadyne’s fluid power expertise, design experience and manufacturing capabilities when developing your fluid handling applications. Pneumadyne has long been a leader in the design and manufacture of high performance pneumatic components. They offer a full line of standard pneumatic fittings which can be modified to better meet your needs, or can develop completely custom pneumatic fittings that will match your exact specifications. Pneumadyne has been designing and manufacturing innovative, high performance hydraulic and pneumatic manifolds since 1976. Pneumadyne has the experience and the expertise to develop the perfect custom manifold for your unique application. Their engineering team will work closely with you every step of the way, from the design and prototype stages through full production, to ensure that your custom manifold matches your specific needs. 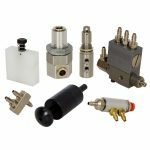 Pneumadyne has been manufacturing high quality, high performance hydraulic and pneumatic valves for nearly 40 years. They can put their engineering expertise and innovative manufacturing capabilities to create a custom air valve that matches the requirements of your unique application.